What’s it really like living with creativity? Look back over the years at the tortured artists, drunken writers and drug-crazed musicians who litter our heritage and you might start to ask the question: is creativity a blessing or a curse? How do people hell-bent on finding their muse cope? Is it the quest for creative fulfillment that causes mental anguish, or is there an imbalance in the first place? Can a creative person ever be truly happy as they constantly strive for perfection in their chosen art? And what is it like living with these two-headed beasts – can they be tamed, or should they be allowed free rein? Supplied in the original frame. Sometimes you just have to stop and have a beer. 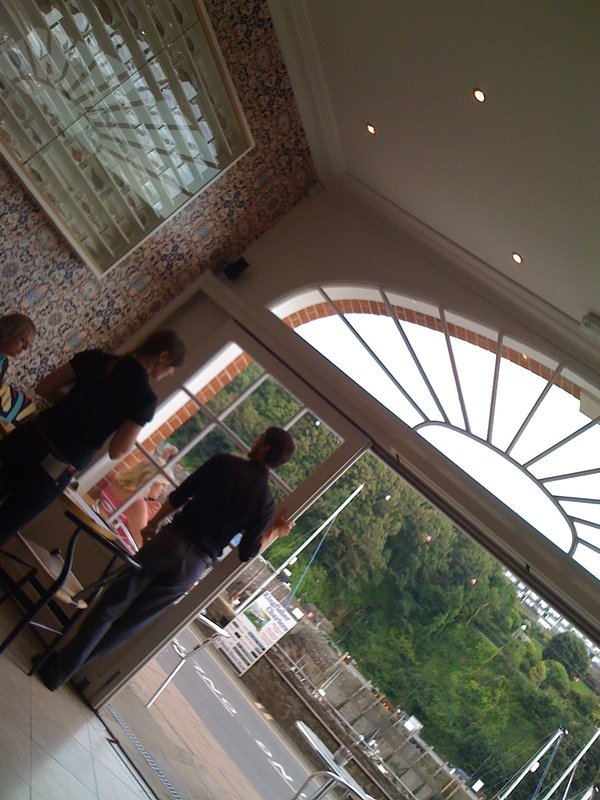 I am surrounded by Damien Hirst’s paintings in a restaurant in Ilfracombe – very fab. Morgue Gallery an online Art Gallery has decided to take its clients peace of mind seriously by employing the services of SiteLock. Their clients can now be assured the consumer details are being handled in a professional way. I have just collected a painting from the framers. 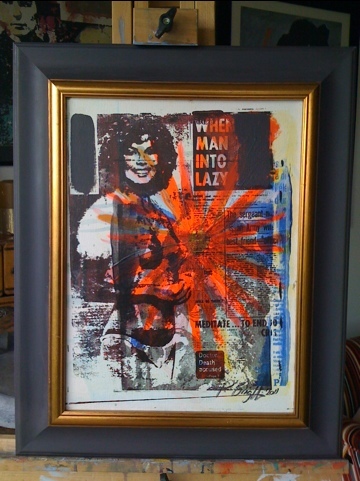 “Allergy #11” was started in November 2003 and completed in April 2011. This painting was originally created for a solo exhibition in The Queen’s Theatre during 2003 but was not exhibited due to lack of wall space. Lot 1 : The choice of one of three paintings or drawings by Gerald Moore. (These will be exhibited in St. Peter’s Church, West Buckland from 15th August until 11th September 2011. Being the ‘Festival Director of Art’ means that ultimately I will offend someone when I don’t select them – who needs to be popular? I would prefer the title curator, which is technically what I have been for over three years. From the Archives: Your Art at the West Buckland Festival (Thursday September 18th and ended on Sunday September 21st) began with an evening preview on the Thursday in St Peter’s Church. There were dozens of works of art – paintings, sculptures, photographs, … Continue reading ? In contemporary art, the title curator is given to a person who better produces knowledge and better picture of any situation. This might involve finding a strategy for display. Thematic, conceptual and formal approaches are all prevalent. In addition to selecting works, the curator often is responsible for writing labels, catalog essays, and other supporting content for the exhibition. I am slowly getting the list together of artist who will be invited to exhibit at the West Buckland Festival in September 2011. The aim of the The Gallery exhibition, which runs during the West Buckland Festival, is promote selected, amateur and professional artist living within the dispersed communities of North Devon and beyond. Past exhibitions have received critical acclaim and have been remarkably successful for artists and visitors. Diversity has been the success of these exhibitions, with entries ranging from textiles, painting, carving, printmaking and ceramics etc. Exhibitors are all artists and crafts people from North Devon. Artists are invited to enter Works of Art that are new or that have not been exhibited before. We expect that there will be up to 100 Works of Art to view and enjoy. Many Works will be on sale and can be acquired during the Preview and throughout the Festival weekend. West Buckland Festival reserves the right to hang the exhibition as they think appropriate and to refuse to exhibit a work if it is regarded as being unsuitable. West Buckland Festival cannot be held liable for any damage or loss, so those exhibiting are exhibiting at their own risk. West Buckland Festival have prioritized original work over prints. Work is offered for sale but a commission of 20% will be charged (deducted form sale price). The total cost of work must be paid to the festival who will issue artists with the balance less commission. For a full list of exhibitions, workshops and evening performances please visit: It’s Cabaret Time! An all star cast hosted by your MC JONATHAN RALPH 7:30 -10:00 pm in St Peter’s Church with HARRY THE PIANO ‘‘the best pianist in the civilized world’ – Jonathan Ross … Continue reading ?